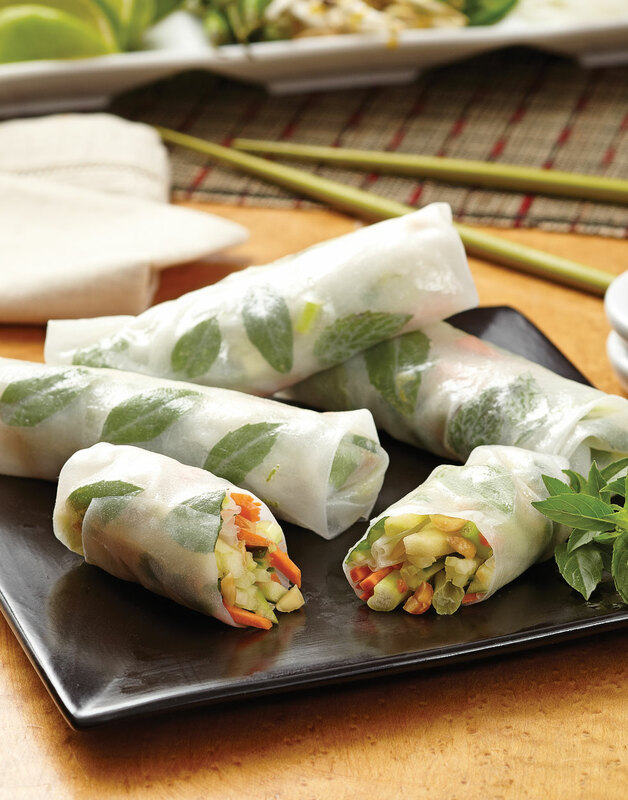 With cucumber, carrot, apple, cilantro, and mint, these spring rolls are the definition of crisp and fresh. And with their pleasantly chewy rice paper wrappers, they're so addictive, you might want to consider having extra ingredients on hand in the event you want to make a second batch! Soak spring roll wrappers in hot water until pliable, 30 seconds;transfer to a damp towel. Place 3 mint leaves in center of each wrapper. Layer carrots, cilantro, apple, scallions, cucumber, zest, and peanuts on top. Squeeze a bit of lime juice over vegetables. Fold edge of wrapper closest to you up over filling. Fold sides of wrappers in toward center to enclose filling; finish rolling. Place rolls, seam side down, on a baking sheet lined with a damp towel, and cover with another damp towel. To serve, cut rolls in half on the bias and serve with soy sauce.